Hydrogen chalcogenides (also chalcogen hydrides or hydrogen chalcides) are binary compounds of hydrogen with chalcogen atoms (elements of group 16: oxygen, sulfur, selenium, tellurium, and polonium). Water, one of the earliest chemical compounds in this series, contains one oxygen atom and two hydrogen atoms, and is the most common compound on the Earth's surface. The most important series, including water, has the chemical formula H2X, with X representing any chalcogen. They are therefore triatomic. They take on a bent structure and as such are polar molecules. Water is an essential compound to life on Earth today, covering 70.9% of the planet's surface. The other hydrogen chalcogenides are usually considerably toxic (much more so than water is), and have strong unpleasant scents usually resembling rotting eggs or vegetables. 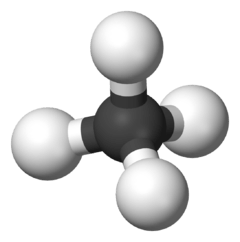 Hydrogen sulfide is a common product of decomposition in oxygen-poor environments and as such is one chemical responsible for the smell of flatulence. It is also a volcanic gas. Despite its toxicity, the human body intentionally produces it in small enough doses for use as a signaling molecule. Water can dissolve the other hydrogen chalcogenides (at least those up to hydrogen telluride), forming acidic solutions known as hydrochalcogenic acids. Although these are weaker acids than the hydrohalic acids, they follow a similar trend of acid strength increasing with heavier chalcogens, and also form in a similar way (turning the water into a hydronium ion H3O+ and the solute into a XH- ion). It is unknown if polonium hydride forms an acidic solution in water like its lighter homologues, or if it behaves more like a metal hydride (see also hydrogen astatide). The names of these should not be confused with the very similar names for tetrahydropyran and its analogues; oxane, thiane, selenane and tellurane. −285.9 +20.1 +73.0 +99.6 ? 1.8 × 10−16 1.3 × 10−7 1.3 × 10−4 2.3 × 10−3 ? — 7.1 × 10−15 ~10−11 1.6 × 10−11 ? Many of the anomalous properties of water compared to the rest of the hydrogen chalcogenides may be attributed to significant hydrogen bonding between hydrogen and oxygen atoms. Some of these properties are the high melting and boiling points (it is a liquid at room temperature), as well as the high dielectric constant and observable ionic dissociation. 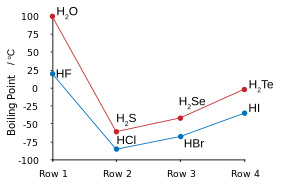 Hydrogen bonding in water also results in large values of heat and entropy of vaporisation, surface tension, and viscosity. The other hydrogen chalcogenides are highly toxic, malodorous gases. Hydrogen sulfide occurs very commonly in nature and its properties compared with water reveal a lack of any significant hydrogen bonding. Since they are both gases at STP, hydrogen can be simply burned in the presence of oxygen to form water in a highly exothermic reaction; such a test can be used in beginner chemistry to test for the gases produced by a reaction as hydrogen will burn with a pop. Water, hydrogen sulfide, and hydrogen selenide may be made by heating their constituent elements together above 350 °C, but hydrogen telluride and polonium hydride are not attainable by this method due to their thermal instability; hydrogen telluride decomposes in moisture, in light, and in temperatures above 0 °C. Polonium hydride is very unstable, and due to the intense radioactivity of polonium (resulting in self-radiolysis upon formation), only trace quantities may be obtained by reacting dilute hydrochloric acid with polonium-plated magnesium foil. Its properties are somewhat distinct from the rest of the hydrogen chalcogenides, since polonium is a metal while the other chalcogens are not, and hence this compound is intermediate between a normal hydrogen chalcogenide or hydrogen halide such as hydrogen chloride, and a metal hydride like stannane. Like water, the first of the group, polonium hydride is also a liquid at room temperature. Unlike water, however, the strong intermolecular attractions that cause the higher boiling point are van der Waals interactions, an effect of the very large electron clouds of polonium. Dihydrogen dichalcogenides have the formula the chemical formula H2X2, and are generally less stable than the monochalcogenides, commonly decomposing into the monochalcogenide and the chalcogen involved. The most important of these is hydrogen peroxide, H2O2, a very pale blue, nearly colourless liquid that has a lower volatility than water and a higher density and viscocity. It is important chemically as it can be either oxidised or reduced in solutions of any pH, can readily form peroxometal complexes and peroxoacid complexes, as well as undergoing many proton acid/base reactions. In its less concentrated form hydrogen peroxide has some major household uses, such as a disinfectant or for bleaching hair; much more concentrated solutions are much more dangerous. 150.2 (decomposes) 70.7 ? ? An alternative structural isomer of the dichalcogenides, in which both hydrogen atoms are bonded to the same chalcogen atom, which is also bonded to the other chalcogen atom, have been examined computationally. These H2X+–X– structures are ylides. This isomeric form of hydrogen peroxide, oxywater, has not been synthesized experimentally. The analogous isomer of hydrogen disulfide, thiosulfoxide, has been detected by mass spectrometry experiments. It is possible for two different chalcogen atoms to share a dichalcogenide, as in hydrogen thioperoxide (H2SO). All straight-chain hydrogen chalcogenides follow the formula H2Xn. Higher hydrogen polyoxides than H2O2 are not stable. Trioxidane, with three oxygen atoms, is a transient unstable intermediate in several reactions. The next two in the oxygen series, hydrogen tetroxide and hydrogen pentoxide, have also been synthesized and found to be highly reactive. An alternative structural isomer of trioxidane, in which the two hydrogen atoms are attached to the central oxygen of the three-oxygen chain rather than one on each end, has been examined computationally. Certain radical compounds such as hydroxyl (HO) and hydroperoxyl (HO2) contain both hydrogen and oxygen atoms and could be classed as hydrogen chalcogenides. The compound hydrogen ozonide (HO3) is not known, although some of its alkali metal ozonide salts are; these have the formula MO3. One or both of the hydrogen atoms in water can be substituted with the isotope deuterium, yielding respectively semiheavy water and heavy water, the latter being one of the most famous deuterium compounds. 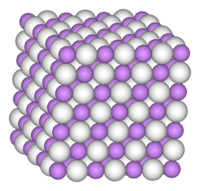 Due to the high difference in density between deuterium and regular protium, heavy water exhibits many anomalous properties. The isotope tritium can also form tritiated water in much the same way. Another notable deuterium chalcogenide is a deuterated version of hydrogen disulfide. Beyond H2S and H2S2, many higher polysulfanes H2Sn (n = 3–8) are known as stable compounds. They feature unbranched sulfur chains, reflecting sulfur's proclivity for catenation. Starting with H2S2, all known polysulfanes are liquids at room temperature. H2S2 is colourless while the other polysulfanes are yellow; the colour becomes richer as n increases, as do the density, viscosity, and boiling point. A table of physical properties is given below. They also react with sulfite and cyanide to produce thiosulfate and thiocyanate respectively. An alternative structural isomer of the trisulfide, in which the two hydrogen atoms are attached to the central sulfur of the three-sulfur chain rather than one on each end, has been examined computationally. Thiosulfurous acid, a branched isomer of the tetrasulfide, in which the fourth sulfur is bonded to the central sulfur of a linear dihydrogen trisulfide structure ((HS)2S+–S–), has also been examined computationally. Thiosulfuric acid, in which two sulfur atoms branch off of the central of a linear dihydrogen trisufide structure has been studied computationally as well. Higher polonium hydrides may exist. One of the most well-known hydrogen chalcogenide ions is the hydroxide ion, and the related hydroxy functional group. The former is present in alkali metal and alkaline earth hydroxides, formed by reacting the respective metal with water. The hydroxy group appears commonly in organic chemistry, such as within alcohols. The related bisulfide/sulfhydryl group appears in hydrosulfide salts and thiols, respectively. The hydronium (H3O+) ion is present in hydrohalic acids. It is necessary for most, if not all, living organisms to ingest water somehow. Hydrogen peroxide can be used as an oxidiser, supplying oxygen in certain reactions. It also has uses as a disinfectant and to bleach hair. ↑ "CIA – The world factbook". Central Intelligence Agency. Retrieved 18 August 2016. ↑ Sumathi, K.; Balasubramanian, K. (1990). "Electronic states and potential energy surfaces of H2Te, H2Po, and their positive ions". Journal of Chemical Physics. 92 (11): 6604–6619. ↑ Goldbach, Andreas; Saboungi, Marie-Louise; Johnson, J. A.; Cook, Andrew R.; Meisel, Dan (2000). "Oxidation of Aqueous Polyselenide Solutions. A Mechanistic Pulse Radiolysis Study". J. Phys. Chem. A. 104 (17): 4011–4016. doi:10.1021/jp994361g. ↑ Hop, Cornelis E. C. A.; Medina, Marco A. (1994). "H2Te2 Is Stable in the Gas Phase". Journal of the American Chemical Society. 1994 (116): 3163–4. doi:10.1021/ja00086a072. ↑ Gerbaux, Pascal; Salpin, Jean-Yves; Bouchoux, Guy; Flammang, Robert (2000). "Thiosulfoxides (X2S=S) and disulfanes (XSSX): first observation of organic thiosulfoxides". International Journal of Mass Spectrometry. 195/196: 239–249. doi:10.1016/S1387-3806(99)00227-4. 1 2 Dobado, J. A.; Martínez-García, Henar; Molina, José; Sundberg, Markku R. (1999). "Chemical Bonding in Hypervalent Molecules Revised. 2. Application of the Atoms in Molecules Theory to Y2XZ and Y2XZ2 (Y = H, F, CH3; X = O, S, Se; Z = O, S) Compounds". J. Am. Chem. Soc. 121 (13): 3156–3164. doi:10.1021/ja9828206. ↑ Laitinen, Risto S.; Pakkanen, Tapani A.; Steudel, Ralf (1987). "Ab initio study of hypervalent sulfur hydrides as model intermediates in the interconversion reactions of compounds containing sulfur–sulfur bonds". J. Am. Chem. Soc. 109 (3): 710–714. doi:10.1021/ja00237a012. ↑ Nishimoto, Akiko; Zhang, Daisy Y. (2003). "Hypervalency in sulfur? Ab initio and DFT studies of the structures of thiosulfate and related sulfur oxyanions". Sulfur Letters. 26 (5/6): 171–180. doi:10.1080/02786110310001622767.